I constantly hear my Torontonian colleagues using Vancouver as a benchmark for a well-designed city to emulate. I went on a deep dive to investigate why some of Vancouver’s contemporary developments seem more resident-friendly. Interestingly enough, Toronto and Vacnouver are actually quite similar in the architectural style, as well as the material and colour palate choice of many of their tall buildings (it actually felt like we can match some buildings in Vancouver to their ‘twin’ buildings in Toronto). In fact, a lot of Toronto’s planning policies are similar to and inspired by Vancouver’s. Like the podium and a ‘slender’ tower: it started there, and first implemented in Toronto in City Place by the developer, Concord Adex, who has worked primarily in Vancouver. 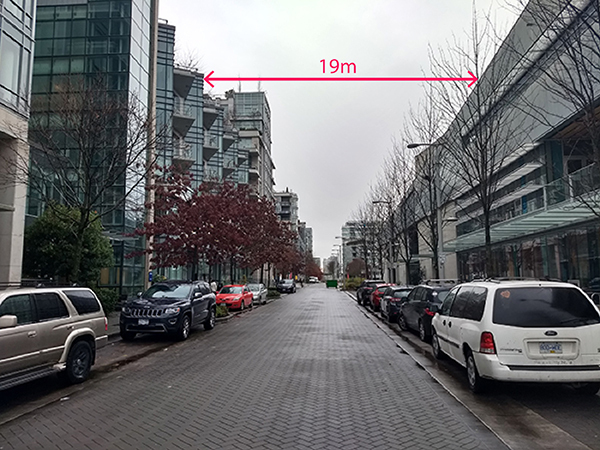 The 750 m2 floor plate and 25m separation between towers are all borrowed from Vancouver guidelines. Even in our work at Growing-Up, Vancouver was our spiritual sister. The mid-rise guidelines: angular planes and step-backs are a Toronto original that was adopted by many cities and Vancouver is among them in some of its policies. So how could similar policies result in such different outcomes? 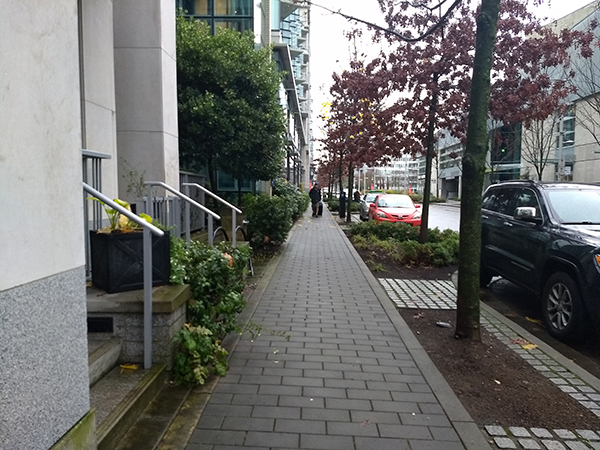 We often hear that high-density neighbourhoods can’t have nice streets, but Vancouver is proof that this is not the case. West Vancouver is the densest neighbourhood in the city with about 22,000 people per km². For context, this is a slightly higher density than the 6th district of Paris. Despite the abundance of tall buildings, Vancouver manages to make this part of the city liveable and beautiful. For example, take a walk around the neighbourhood and you’ll see tons more trees and bike lanes than in downtown Toronto. There is one more difference worth mentioning: one of the hot topics during last year’s Toronto mayoral race was the Gardiner Expressway, a mile-long elevated road that cuts right through the city. The Gardiner has worked to break up the city and decrease the livability in and around this potential downtown real estate gold. Vancouver, on the other hand, is probably the only North American city that doesn’t have a major highway cutting through it. Thanks to Vancouverites who protested back in the 60’s, Vancouver has maintained a more cohesive city with better use of its space. I should also point to the building massing articulation and how beautifully the landscape is planted but I believe the real answer to the question we raised in the title and we would like to emphasize on is much simpler and is planted in the distance between buildings and the concept of compact streets. 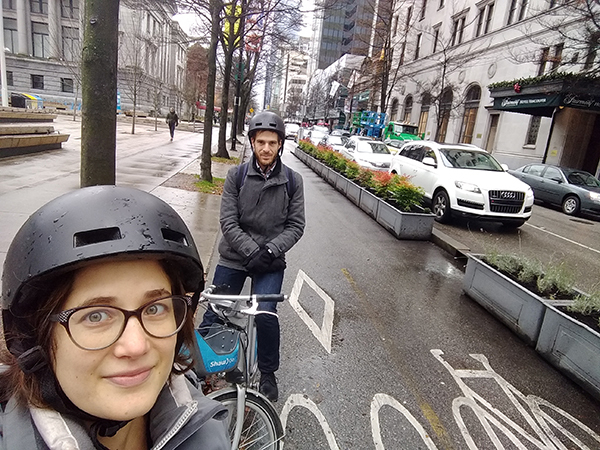 When I look at some of Vancouver’s new and older downtown areas, it’s clear that these questions were carefully considered when they were being developed. 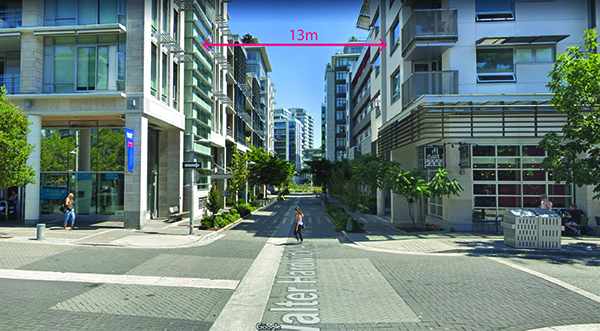 Vancouver neighbourhoods may not be the most spacious, but they more than make up for it with a thoughtful use of space. For example, let’s examine part of the new Vancouver Olympic Village. 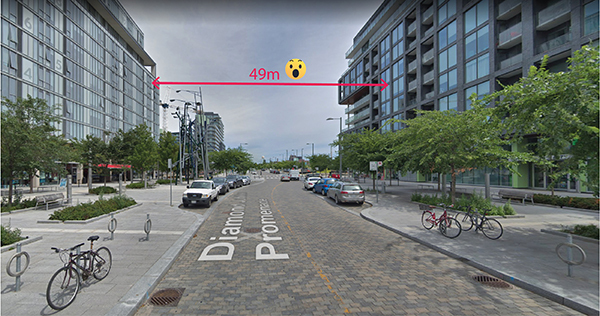 In this area, buildings are actually much closer together, and new streets are narrower (here in Toronto you will only find this width in ‘neighbourhoods’ with single-family houses on both sides of the street), yet it’s a comfortable area for pedestrians. You see small and beautiful plaza squares between taller condo buildings protected from the main road. There’s a sense of community embedded in the space. Yes, we’ve all read the Jane Jacobs book and understand the importance of wide sidewalks. But what’s just as important as a wide pedestrian space is how you use it: What is occupying this space? What buildings surround it? How does it feel to walk along it? Many new developments in Toronto, however, aren’t as thoughtful with their use of space. I never met a transportation consultant in any of the master-plans I worked on who allowed any right of way less than 18m wide, and that was for the smallest, most community-oriented streets in the design. 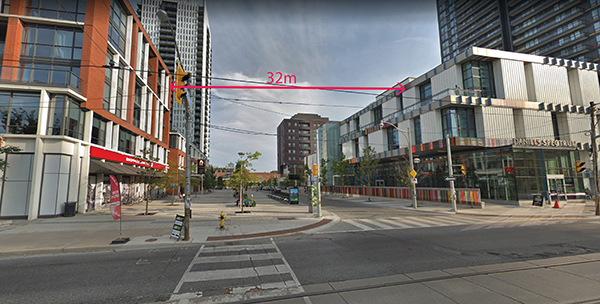 Parts of the master-plan of Regent Park for example, has a massive 32m-wide pedestrian space in between two buildings (with one vehicle lane), which doesn’t help boost any sort of community feel in the neighbourhood. Corktown contains a 12m-wide sidewalk and a 40m R.O.W (right of way = property line to property line) and 49m building face to building face. Which just feels deserted and also fails to create any sort of community charm. People who oppose development often like to use the “alienated condos” card and these barren unused public spaces certainly don’t help. ‘Urban Design’ is an unquantifiable part of the design of a master plan when a new block pattern is introduced and the development approval process in general. Yet it is so easy and distinguishable when you walk in great urban envirounments (think about any European city you last visited). As architects and urban designers, we are in constant search of what makes great new developments a great new piece of the city.